fter working and studying in London for three and a half years, I returned to Singapore in 1998, aged 25. Young and single, I was ready to meet someone. I had a limited social life back in the UK - my colleagues were attached or married, and my Asian friends had gone home to their respective countries - so I spent many weekends by myself. But I wanted to change that. Online dating was coming into fashion, and I was excited about giving this new avenue a shot. 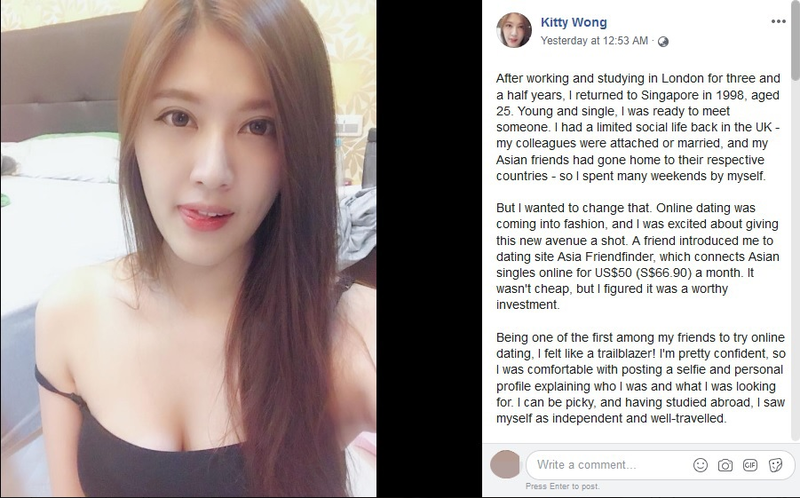 A friend introduced me to dating site Asia Friendfinder, which connects Asian singles online for US$50 (S$66.90) a month. It wasn't cheap, but I figured it was a worthy investment. Being one of the first among my friends to try online dating, I felt like a trailblazer! I'm pretty confident, so I was comfortable with posting a selfie and personal profile explaining who I was and what I was looking for. I can be picky, and having studied abroad, I saw myself as independent and well-travelled. I wanted someone with a global mindset, preferably an American-born Chinese (ABC) who should not be more than five years older. He had to have a decent education, with at least a diploma. I didn't mind taking the initiative to message guys I was interested in, asking about their hobbies or profiles. I got responses 60 per cent of the time. When guys messaged me, I'd only respond to those who asked about my interests - travelling, reading and cooking. SINGLE MUM PINOY FT SEDUCED SG HUSBAND, SAYS SHE'S LOOKING FOR "REAL LOVE"